An island that appeared on maps of the British Isles until the 19th century before disappearing has been rediscovered by Ordnance Survey while conducting aerial surveys off the west coast of Scotland. Head of OS Leisure Rob Crusoe says: “It’s an astonishing discovery that will have walkers champing at the bit”. Three kilometres east-west and four north-south, complete with mountain, loch, natural arch and sandy beaches, it appears to correspond with descriptions of ‘Hy Breasal’ or ‘Hy-Brasil’ – a once-thought mythical island not sighted since 1872, and never before surveyed in detail. (The agency’s map of the island is published in full in the new issue of OS partner publication Country Walking magazine). 34 miles north-north-east of uninhabited St Kilda, itself 55 miles off South Harris, the remote discovery appears to confirm observations by ancient cartographers, who from 1325 onwards insisted on the existence of an outlying island explorers described as a ‘promised land’. The name derives from the celtic word Breasal meaning ‘High king of the world’. Historical descriptions of the island – once thought shrouded in mist for all but one day every seven years – vary in spite of landings being made in 1480, 1481, 1497 and finally 1674 by Scottish captain John Nisbet, who sent a party of four ashore. In Nisbet’s account the sailors were met by an old man who told them he lived alone in a castle on the island. The remains of what appear to be a castle on Breasal Beag (an islet separated from the main island by a sandy sound), may corroborate the report. The discovery has been hailed by the National Trust for Scotland, whose spokesman David Dennison said: “This is perhaps the most astounding gift ever made to the National Trust for Scotland. Our priority will be to send a survey party to record Hy-Breasal’s flora and fauna, especially the rumoured colony of Lepus ater." A 9.6km2 island of mainly conachair granite featuring quartz, perthitic alkali feldspar and albitic plagioclase. Pervasive shattering of gabbros and dolerites to form breccias. Extensive machair shading to ling, bell and cross-leaved heather moorland to a maximum altitude of 268m / 879ft. One small woodland of mainly spruce and pine, one major body of fresh water, Loch Caoraich. Extensive system of strandline and mobile dunes. Several remnants of pre-Norse settlement including pens, walls and habitations. Hy-Breasal appeared on maps of Europe from the 14th century onwards. 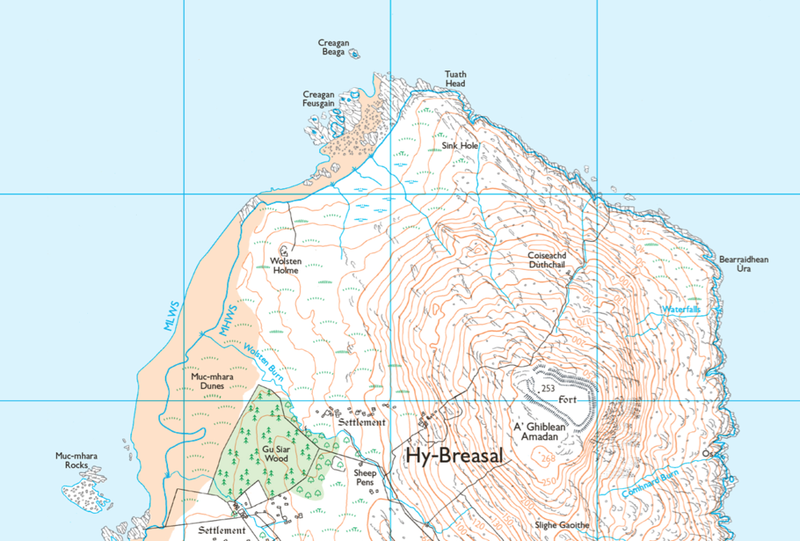 There are not yet any paths on Hy-Breasal but the island’s sole peak A’ Ghiblean amadan (268m / 879ft) is sure to prove a tempting draw for walkers, with its dramatically shelving eastern aspect and unusual fort-topped summit. But the island turns its most hospitable side to the west and the Atlantic – to which it presents a mile-long beach and easy-angled slopes that (as Nisbet’s account has it) provided pasture for an extensive herd of large black rabbits. Crofters from the now-uninhabited neighbouring archipelago of St Kilda offer a glimpse of what life on Hy-Breasal may have been like. The map is published in full in the latest edition, available now with free P&P. Win a Fjallraven Greenland Makeover!